Arguably, the problem with retail is that you can’t do a single thing about the customer: they tend to come in bulk, there’s no specializing the order, and the manufacturers tend to have unique ideas about what constitutes a well-made product. Which leads me to the latest news. There’s a story in the papers—well, the latest version of a common anecdote—about how retail America is going broke. This week it was Bebe. Last month it was Staples. In February it was JCPenney. Stores are closing at an epic pace. 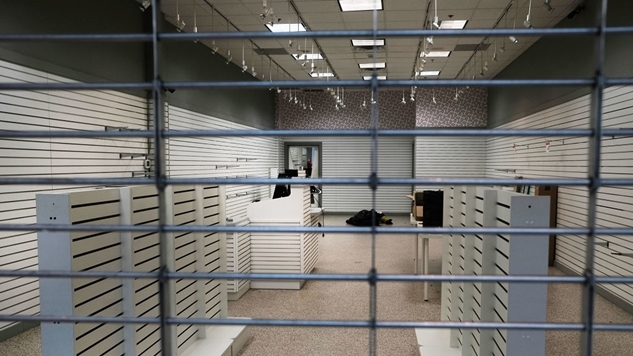 In fact, the retail industry could suffer far more store closures this year than ever. Brokerage firm Credit Suisse said in a research report released earlier this month that it’s possible more than 8,600 brick-and-mortar stores will close their doors in 2017. ... Physical store fronts have been eclipsed by ecommerce masters like Amazon. The toll it’s taken can be seen in emptying malls and shopping centers across the country. And everywhere, in all sources, this is all made out to be the work of computers—and just computers. As if car collisions were worked out by the conjunction of bad email servers, and poor investments went awry under the perverse eye of the Facebook. One retailer, even if its name is Amazon, is not and cannot be the headsman for an entire economic niche. Amazon will kill Wal-Mart, but it cannot kill everything. Stores that last long and weather much do not just go away, even if technology arrives. For every obvious example—Blockbuster—there are a dozen industries that survive. Movies didn’t disappear because of TV, any more than movies collapsed radio, or radio destroyed print. The real, actual history of what happened to retail is there between the cracks, for he who has eyes to read. It’s even there in the same Business Insider story I quoted above: “Visits to shopping malls have been declining for years with the rise of e-commerce and titanic shifts in how shoppers spend their money.” That last section is where you want to put your attention: “and how they spend their money.” This is code for spending less. Department stores like JCPenney, Macy’s, Sears, and Kmart are among the companies shutting down stores, along with middle-of-the-mall chains like Crocs, BCBG, Abercrombie & Fitch, and Guess. Some retailers are exiting the brick-and-mortar business altogether and trying to shift to an all-online model. Forget the palliative fantasy camp of all-online. In retail, the major component you can cut away in selling—the final frontier, really—is the stuff that made shopping fun, or at least mildly inoffensive: stores, and salesman. Amazon is not a quantum leap, but one more level of spending cut away. Middle class buying is slowly, ever-so-slowly, being whittled away. This leads us to the second cause of retail decline, which is endemic to modern American business. I call it the Sears problem. If the online world is what is killing the retail giants, then how do you explain the slow necrosis of Sears? Sears was the Prince or Nikola Tesla of retail: they invented everything in modern retail and did it all right. Sears. Formerly Sears, Roebuck, & Co. Of Chicago. Reading its earlier days, for business-inclined folks, is like reading the Homeric sagas or being up-to-date on apex predators. They literally did it all. Imagine reading the autobiography of a train-sized tiger armed with lasers, and that’s Sears: building a gigantic, Sarumanic tower in the heart of Seventies Chicago was an afterthought. The word colossus is mere documentary truth. What the Mississippi was to American prosperity, Sears was to manufactured goods: the source. In some cases the only source. Consider if the Titanic really had been unsinkable. That was Sears. They could have punched out God, if the deity had sold wares. When Geoff Colvin last December wrote “Millennials may be astonished to learn that Sears was once America’s largest retailer, so utterly dominant that it would obviously be No. 1 forever; with its massive economies of scale, no competitor could ever hope to topple it,” he was making a serious understatement. The company sold the best tools and touted their softer side. That’s like being king of drinking and calculus: how is it even possible? But Sears made it happen. “Except for the fact that it had no website, Sears might as well have been digital. Everything was the same as a digital retailer except for the servers and the html and the algorithms … and one day when the West was won, Sears decided to open department stores across the land. ... The most ironic factor in the failure of Sears in an age of digital retail is that at one time it had the same business model as a digital seller. Nowadays, Sears is, to quote Edwards, “a hedge-fund polymorph called Sears Holdings.” And that’s what killed Sears, along with the rest of the American company: financialization—short-term profit-scrounging instead of long-term investment—murdered it all. Let me repeat that: Sears was the original online company. Along with the failure to safeguard the middle-class, companies stopped building value. Amazon’s the end result of a mindset which tells the owner to cut costs, not to add in worth. The downturn in retail in the mid-nineties—1994, specifically—could have been weathered. Sears could have done it, even that late. Their 1886 founding gave them a slight lead, you understand. Much like XEROX had the first operating system, before Steve Jobs and Bill Gates sneaked by. Sears had the know-how, and the catalogs, and the phone bank. They mass-marketed and shipped everywhere on Earth. But during the business era which celebrated Jack Welch and the number-slashers, Sears bought into the neutron-bomb pipe dream. They behaved like rich kids on a questionable two-week bender in Cancun. All of the Sears sub-businesses that could have given them a high hand over Young Bezos, they pawned. They did it to score quick money for their shareholders, who should have known better. They had a credit card, and investment arms—that’s how far ahead they were. You could buy tires, washing machines, shirts, socks, shoes, power drills, eyeglasses and barbecue grills. Most everything. They sold all of this, all their advantages, for a mess of pottage. And they gutted the catalog stores and mismanaged everything. Moreover, they let the goods—the very thing they did well, better than anybody else—decline. And they hired penny-ante staff who had about two words to say about their products. There used to be absolutely nothing a Sears salesman couldn’t tell you about their material. Goodbye to all of that. I remember a distinct point during the Nineties where one of my Texas uncles opined that Sears tools had become ridiculous garbage. In retrospect, that’s when I realized the company was doomed. Sears is losing—and it didn’t have to be that way. Sears stopped being a company, and began their long, slow metamorphosis to being, well, a Sears Holding company: a collection of offices that doesn’t do much, but push numbers around, while engaged in the minor side business of retail. Obvious parallels with American government, or the world of business, are not hard to make, and will be left to the Reader’s own imagination. The decline of middle-class spending springs from the same short-term thinking as the decline of a once-great business. The rescue for American retail is the same as the rescue for the American economy at large: you can’t cut your way to success, you can’t rent-seek your way to Park Avenue. You get out what you put in, and the age of selling short is paying less all the time.